In order to use Strudel Desktop you must install some software. 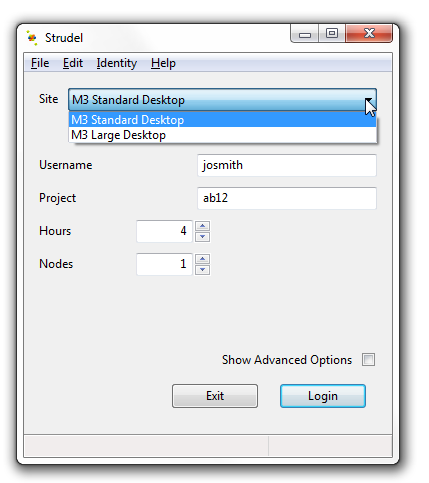 Strudel Web is an alternative to Strudel Desktop and requires only a modern browser to run. In addition, you may require a file transfer application. Download TurboVNC: Go to the TurboVNC download site. This site detects the operating system of your machine and automatically suggests the version to download at the top of the list of folders. MacOS users: if you experience any problems with the default TurboVNC-2.1.1-AppleJava.dmg (e.g. Java issues), try the alternative version: click on the folder 2.1.1. and locate the file TurboVNC-2.1.1.dmg, near the bottom of the file list. If you need help, email the MASSIVE helpdesk for assistance. If you have any copies of Strudel installed on your machine, it’s recommended that you uninstall them and then install the latest Strudel (see link below). Windows Firewall may try to block Strudel, if you’re not sure how to unblock it, contact the MASSIVE helpdesk. A variety of linux builds are available for download. Other Linux builds may be created by submitting requests to the MASSIVE helpdesk. You may require a file transfer utility to move files to and from your CVL desktop. Filezilla FTP is recommended. More information on using SFTP with your desktop. 3. Set various parameters for your session. See instructions below for you chosen authentication security option. When you select Remember me on this computer the system will create an SSH authentication token (an SSH key pair) on the machine you are currently using. You will be required to create a passphrase that will be used to decrypt the key. (In the next step, you will be asked to use your MASSIVE account password to insert the encrypted key.) The passphrase is used to decrypt the private key on your computer. Once you’ve done this, your machine will have access to other systems using the same key, without your needing to use your passphrase (or password) again. 1. The next screen will ask you to enter and confirm your passphrase. Select [OK] when done. Note, a passphrase can be a word or sentence, using any letters or symbols (handy guide for choosing strong, but easy to remember passphrases). When you log in again you will be required to enter your M3 account password. Once you’ve logged on you will be presented with a Linux desktop. To access the desktop’s applications, click on Applications in the top menu. Note: When closing your the desktop you will be asked if you would like to leave the current session running so that you can reconnect to it later, or to end the desktop session and release the VM back into the M3 VM pool. If you no longer require the desktop, ensure you end the session. Note clicking on new desktop KILLS the previous session! IMPORTANT REMINDER: ALWAYS REMEMBER TO SAVE ANY UNSAVED WORK BEFORE YOU DISCONNECT - AND ESPECIALLY BEFORE YOU KILL A DESKTOP SESSION! If you have any questions or require assistance with connecting to your desktop, contact the MASSIVE helpdesk.